What are ByeBites products used for? 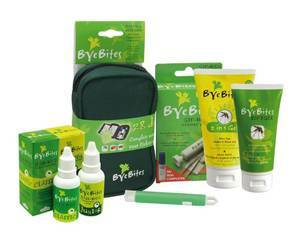 ByeBites protects against and treats insect bites naturally. ByeBites products do not contain DEET or other harmful substances, which makes them particularly suitable for small children, pregnant women and people with sensitive skin. The ByeBites skin care line consists of insect repellents and treatments for when bites do occur. The ByeBites range also includes instruments for removing insects, stings or excess venom. Insects - wasps, mosquitoes, ants and horseflies - are everywhere and they may sting or bite. These bites can be painful or itchy. Some insects, such as tics and malaria mosquitoes, can transmit serious diseases. That is why it is important to keep insects at bay. Many insect repellents contain harmful toxins which don't only keep bugs away but may also cause health problems or skin irritation. ByeBites products contain only natural ingredients and can therefore be used safely. ByeBites SoftGel: mosquito gel made with citronella oil. Mild on the skin and gives six hours of protection. Also suitable for children from the age of six months. ByeBites 2-in-1 Gel: insect repellent aftersun gel that keeps mosquitoes away and sooths, softens and moisturises the skin after sunbathing. Gives up to six hours of protection. Ideal for summer evenings out. ByeBites Gone Itch Classic: calms the skin and instantly reduces swelling and itching of stabbing and bites. Suitable for adults and adolescents. Usage: apply a few drops to the affected skin directly after the bite. ByeBites Jeuk-Weg (Gone Itch) Junior: especially developed to treat children's fragile skin after insect bites or stings. Relieves itching, pain and swelling. Suitable for children from the age of six months. Usage: apply a few drops to the affected skin directly after the bite. ByeBites Sting and Bite Kit: handy nylon bag with, among other things, a tick tweezer, extractor pump to remove venom from bites and stings, cooling spray, magnifying glass, various size plasters, and a first aid guide for tick bites. Convenient for on the way. ByeBites Tick Tweezer: easy-to-use tick tweezer. Effective tool for removing both small and large ticks. ByeBites products do not cause any side effects. If you do experience side effects, consult a doctor. Do not use if you are allergic to any of the ingredients in ByeBites products (see the label on the package or package leaflet). Always apply lotions and liquids to intact skin and avoid contact with the eyes or mouth. ByeBites products should not be used on children under six months of age.